Congratulations to Edward Reagan, winner of the sculpture naming contest: “Off to Magical Places”. The sculpture was donated by Jane Pinckney and following is a statement from the artist, Ken Memoli. 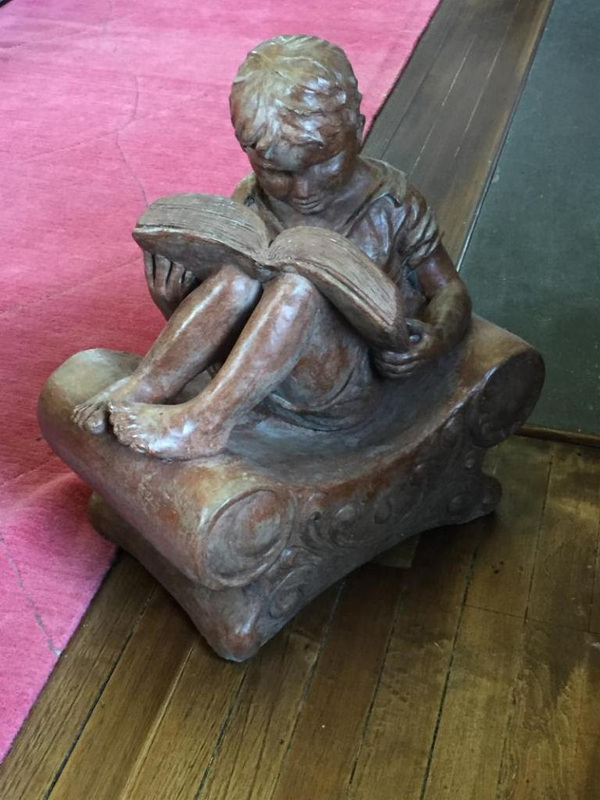 The sculpture of the little boy reading in a relaxed pose came as an image from thoughts from long ago. A child, a place and a cerebral journey that we all escaped to now and then. Traveling in innocence, on our way to the myriad of unimaginable adventures that lie, waiting for us all on written pages. It is an apt metaphor, no matter the age. If we read, we can imagine. If we can imagine, our world can be transformed by the focus of the eye, and the transplanting of the mind’s time and place. A simple, and innocent idea that one perhaps imagines and makes manifest in the image of the sculpture. Just one of the innumerable images that has been gifted to the world through the mythological arts. The ‘calling to adventure’ of the earth-bound soul… that so many of us hear, but few will follow. It is one of the main purposes of the artist to remind the earth journeyer of the adventures that await…just beyond the threshold of their comfort-zones, and often that threshold is the cover of a beautiful book.